A Yummy Mummy Can Drive A Child Bananas - The Lazy HouseHusband - Reflections Of A Stay-At-Home Dad! When I announced to my parents in my late teens that I was leaving home to go “do my own thing”, my mother prepared for me a 20-odd page typewritten manuscript entitled “Look Hands – No Mum!” Survival Kit. On Page 2, under “Useful tins and food to always have in stock”, Mom lists twelve kinds of food I should always have in the cupboard, with a thirteenth entry at the bottom of the page, warning me in capital letters: “SPEND YOUR MONEY ON FRESH FRUIT AND VEGETABLES”. It’s encouraging to look back on this and think that my mother actually believed I would have money to spend on things like food when I moved out of home … I am still looking for that magic formula thirty years later! Moving on through “Look Hands – No Mum”, we then come to page 3, where I am thrown straight into the deep end of my young culinary abilities. The page details a “black bean and meat stew” recipe that, although one of my favorite meals when Mom makes it, requires two days of preparation … sorting beans and soaking them overnight, marinating special cuts of meat, checking every 20 mins that the water hasn’t dried up and preparing a”secret” hot sauce to add as a condiment to the beans and meat in the final stages of the cooking process. That’s placing quite a demand on the resources, patience and attention span of a teenager who was destined to become a “lazy househusband” later in life, don’t you think? Which is probably why I never finished reading Mom’s survival guide. I did flick once more through it out of respect for the amount of effort Mom put into preparing this manuscript for me (that and the fact that I had invited a girl over to my place and I wanted to impress her), but after four pages of what looked like really complicated ways to prepare chicken, trifles and desserts, we come to page “7” where Mom gives out detailed instructions on how to boil an egg. I must have felt utterly helpless and insulted at this point, and I probably ordered chinese or something like that. Anyway, now that I’m a stay-at-home dad, I am faced everyday with the challenge of making sure that my kids also eat a healthy meal. That’s quite a responsibility for someone who usually gets so preoccupied with work that they forget to eat altogether. Destructo, however, is home with me all day, so I have to keep feeding him during the day. 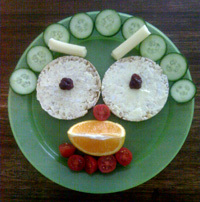 For any other dads who are struggling with what to make their three-year-olds for lunch, the Yummy Mummy (or “Yummy Mommy” if you’re an American Dad!) is a savior. 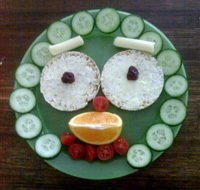 Take a non-breakable plate, chop up a cucumber into slices and place them around the plate for hair, add two rice crackers with margarine, or any other toppings and a sliced cherry tomato for eyes (sometimes I use little beef jerky nuggets), snap a cheese stick or a carrot in two for the eyebrows, make a nose and mouth out of cheese, fruit, or anything else you fancy, and serve with a flourish and a smile. Your kids will never grow tired of seeing their mom’s tasty face served to them on a plate and will delight in picking out mom’s eyes, nose, hair, etc … and gobbling her all up. To do this, just hide some of the cucumber slices to give the face “shorter” hair (it’s stereotyping I know, but it works for most kids!) and invert the eyebrows to give the face an “angry” expression. Then, when the joke is over, just return the eyebrows to normal and add the remaining cucumber slices to the plate and … voilà! Yummy Mummy has returned!